Me: Happy Thanksgiving! Can I cook an entire Thanksgiving dinner in my tiny kitchen? Time to find out! My Big Important Internship was almost at an end, and my family decided to come out to New York City to visit for Thanksgiving. This was a pretty big deal because not only would I have to coordinate making an entire Thanksgiving dinner in my apartment’s itty-bitty kitchen (about the size of a small coat closet, big enough for one person to stand in at a time), I was also responsible for acting as tour guide in the city. A Broadway show would be on the itinerary, but would I go for the obvious choice for the out-of-town family? Here is the original Broadway cast and the cast when I saw the show. Principal actors who were not members of the original cast are in bold. Considering that the show has been running on Broadway since 1997, it is incredible that any members of the original cast were still in the show, so kudos to Tom Alan Robbins! Actually, this wasn’t my first time seeing The Lion King on Broadway. Back in high school, I came to New York on a choir trip. We performed in a choir competition and saw two shows, Thoroughly Modern Millie and The Lion King. 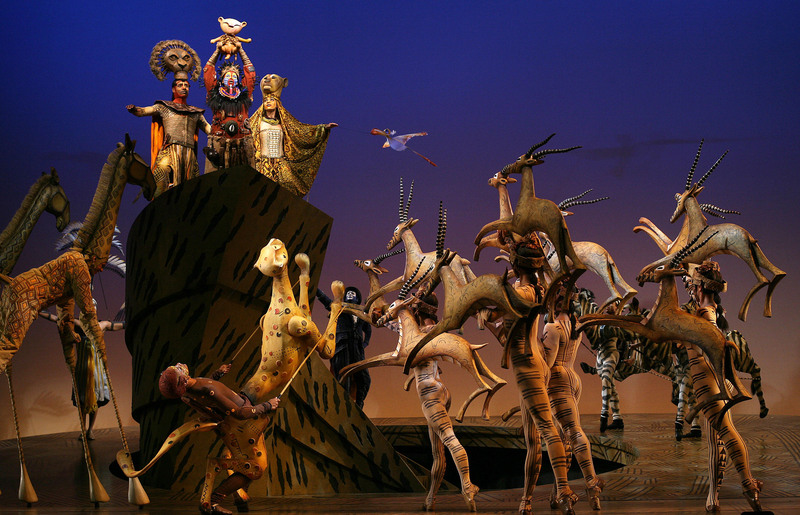 Back then, The Lion King was at the New Amsterdam Theatre. We were way up in the back rows of the balcony, but everyone was blown away by “Circle of Life.” I remember all of us cheering and saying to each other, “Whoa, and that was just the opening number!” Unfortunately, nothing else in the show ever topped that moment or even equaled it, and some of us laughed at rather inappropriate points, like Scar falling from Pride Rock and the hyena dance break in “Be Prepared.” When I bought my tickets for the Thanksgiving visit, I attributed my reaction to teenage cynicism or peer pressure or just a weird mood, and I was ready to give The Lion King another chance. By 2009, Mary Poppins had moved into the New Amsterdam, and The Lion King had moved down to the Minskoff Theatre. It was a new theater and vastly improved seats, optimal conditions for a second time around with the show. “Circle of Life” was as incredible as I remembered, and the set and puppetry was more impressive from the orchestra than the back rows of the balcony. I remembered that there were a few good new songs, like “Shadowland” and “He Lives in You.” My family, especially my mother, loved the show, and it was a highlight of the visit. To be honest, though, I still don’t love The Lion King. There is a lot to admire about it, like the set design, costuming, puppetry work, and music, but there are problems too. Tonally, the show switches from solemn and sad to silly and goofy near the end of the first half, and it happens way too quickly. The humorous parts with Timon and Pumbaa are almost word-for-word from the film, and the writers didn’t add any new jokes. The bigger problem is that the jokey parts don’t mesh as well in the stage show as they do in the original animated film, and that seemed to be true regardless of which actors were playing Timon and Pumbaa. Also, my first impression about “The Circle of Life” held true. It is the highlight of the show, and nothing in the show can match it. Am I glad I saw it? Absolutely. I would recommend that anyone who loves theater or has an affection for the original film see it at least once, but it will never be one of my favorite Broadway shows. And that’s okay. Unlike the Mary Poppin Playbill, there are no special additional articles about the making of The Lion King. 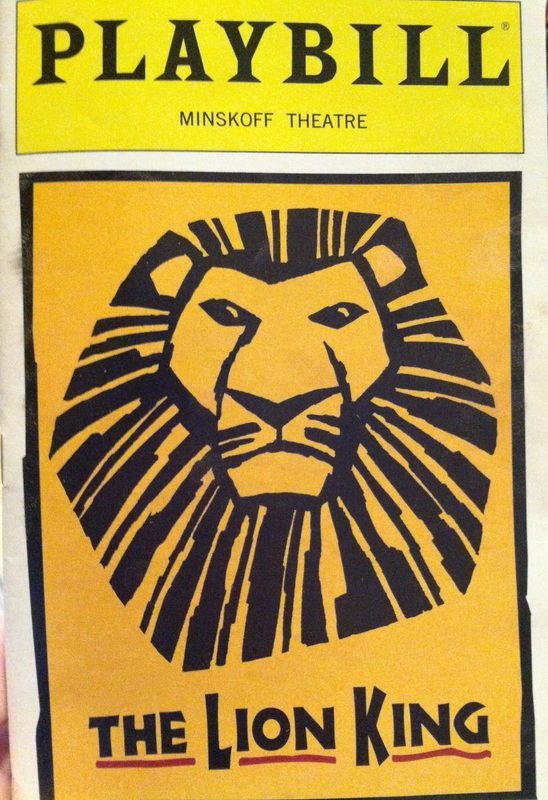 There were the same articles in The Lion King Playbill as the Hair Playbill.